UDM Downloads > PDF to Word Converter Pro! 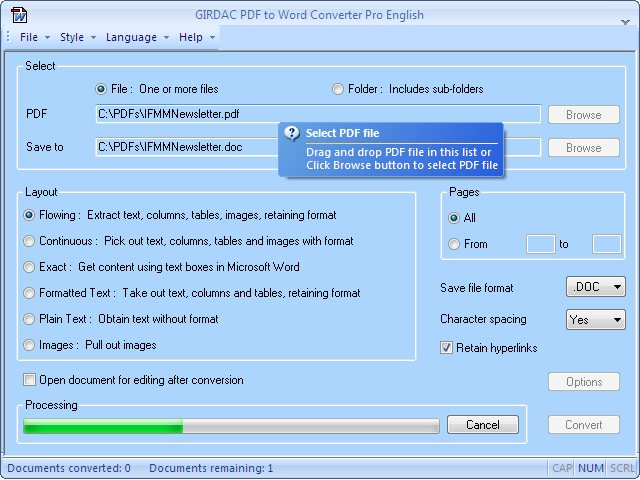 GIRDAC PDF to Word Converter Pro is an enterprise application for converting PDF documents to Microsoft Word .DOC, .DOCX, and .RTF file formats, and plain text file. It extracts images from PDF documents. It converts PDF documents with six Layout options: (a) Flowing: Converts PDF documents retaining the format with text, columns, tables and images. (b) Continuous: Converts PDF documents picking out text, columns, tables and images with format, no page gaps. (c) Exact: Converts PDF documents by making several segments same as text boxes Microsoft Word. (d) Formatted text: Converts PDF documents retaining the format and text, discarding images. (e) Plain text: Converts PDF documents by extracting text without format. (f) Images: Converts PDF documents by picking images only. It makes converted document easily editable. It retains PDF document hyperlinks in the converted DOC, DOCX or RTF document. It converts PDF documents to .RTF and .TXT formats without Microsoft Word and Adobe Reader installed. It supports 60 user interface languages: Afrikaans, Albanian, Arabic, Armenian, Belarusian, Bulgarian, Catalan, Chinese, Chinese Simple, Croatian, Czech, Danish, Dutch, English, Esperanto, Estonian, Farsi, Finnish, French, Galician, German, Greek, Hebrew, Hindi, Hungarian, Icelandic, Indonesian, Irish, Italian, Japanese, Kannada, Korean, Latin, Latvian, Lithuanian, Macedonian, Malay, Maltese, Norwegian, Papiamentu, Pashto, Polish, Portuguese, Romanian, Russian, Serbian, Slovak, Slovenian, Spanish, Swahili, Swedish, Telugu, Thai, Turkish, Ukrainian Urdu, Vietnamese, Welsh and Yiddish. It provides seven User Interface styles: Office 2000, Office 2002, Office 2007, Vista Black, Vista Aqua and Vista Silver. Its trial version converts up to three pages for ten PDF files.